So why would I be surprised to learn that this mindset has poured into our physical world? After all, we are planned, scheduled, and timed human beings. We are all maneuvering through life’s master to-do list with the key milestones that need to be met in order to keep pace with what is socially accepted as success or what we are expected to do. Almost every story in our research started as “we met, went to school, got married, then we got a house, a pet, and then, of course, it was time.” There is an expected sequencing of life that is in the background of everything we do, and many of us are on autopilot cruising through life. What adds to the equation is that we know that couples are building families later in life. For many, dual incomes are a necessity leading to a head-down mentality to build their careers and reach financial stability. Women tell us that even before they started trying they felt that they were in a race against time because the industry tells them that their biological clocks are ticking. So what happens when “it’s time” meets a delay? In the material world if we were to see a product on “back order” or even worse “out of stock” most of us would immediately go elsewhere. God forbid it would happen more than once—we would immediately withdraw from our Prime status. 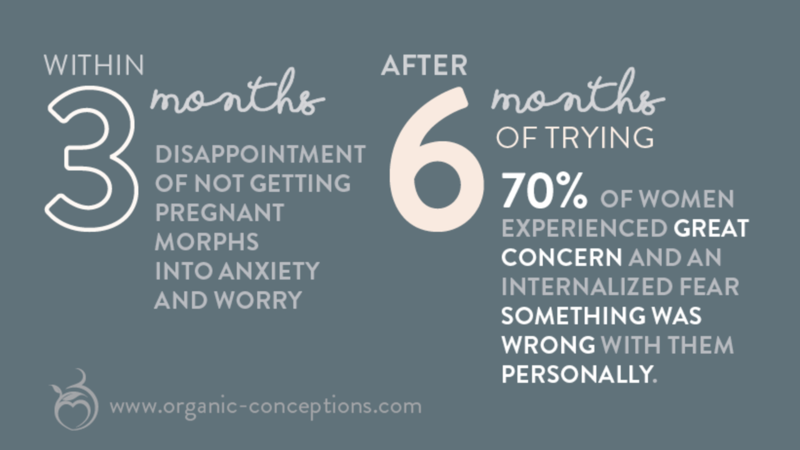 When it comes to starting a family, if there was any prior concern about conceiving (impact of birth control, a known condition, some gut instinct that there might be a problem, and that dreaded ticking clock) these early concerns immediately mix with “the delay” to create a catalyst that leads to what we describe in our program as the “conception of doubt”. With little to validate a woman's feelings, they begin to ruminate and create “what if” stories that lead to deep-rooted emotions and fear about not living up to both their identity and life purpose. Women take on the ownership of the situation, and their primal innate instincts kick in. They go into fix-it mode, creating a narrative around “it’s my body—it must be my fault.” They were taught that they must do “whatever it takes” to solve the problem and achieve the desired goal. This is where we come in. What if, when the stork (or even a drone) doesn’t deliver on-time, women and couples were able to reshape their natural reaction during this awful gut-wrenching process? Can we accept and be open that this one facet in our life (creating life), will deserve a different mindset than our material world? Is it possible that this journey into the unknown might just be the one thing that can change our complete outlook on everything that we do and our purpose of life? Are their gifts to be had when we embrace these unknowns and uncertainties when we change our relationship with this journey? Does what we learn through this experience provide us the necessary tools, ones that can’t be taught, which allows us to be better role models to the children that we will guide in this fast-paced, on demand, always on, life? I believe that when we are in this space, unable to control every detail, unable to track your package or determine our exact course, is where life’s meaning and purpose emerge. The miracle of life is born in this unknown space, however, it can only be conceived if we change our relationship with it. So how do you do that and quickly... after all time is running out :-). Well, Dr. Kate and I feel humbled to expose the statistical evidence that can explain those frustrating stories of couples who conceive naturally after adoption (and the million other variations of such stories). We guide couples through the 9 key critical transitions that will ultimately change their relationship with themselves, their bodies and the mystical and beautiful journey to parenthood. To learn more about these transitions visit "click here"